Successful things are being copied all the time. Unfortunately, in many cases the copy does not deliver what it promises. Sometimes, this only becomes obvious when the copy is carefully scrutinized and the performance criteria of the Original are well-known. 1. To obtain a BF data sheet, the spacer system manufacturer has to submit an application to the BF offices, including full documentation for verification. According to the regulatory requirements, not only the test reports for the thermal performance are requested, but also reports of system tests for the long term behavior according to EN 1279 parts 2 and 3. 2. The Quality Committee of the GMI will conduct the assessment of the submitted documents. Amongst other things, the system test reports and the consistent indication of the sealant back cover are double-checked. If there are reasonable grounds to doubt the usability of the system, the Quality Committee will reject the application and no BF data sheet will be issued. 3. The detailed examination is designed to avoid data sheets for spacer systems which might have excellent thermal performance but are not suitable at all for the long-term use in insulating glass. With the regulatory procedure the BF tries to safeguard its members from damage through systems that are not sufficiently tested, lacking the proof to work in practice and therefore carrying a high risk of failure. 4. The Warm Edge Working Party has agreed that the measurement of equivalent thermal conductivity and the simulation of representative Psi-values have to be carried out at ift Rosenheim, to ensure that all systems are tested under exactly the same conditions. This allows a fair comparison of the thermal performance of spacer systems. 5. Data sheets are only valid if they are currently shown on the BF website. Users are able to quickly verify at any time through http://www.bundesverband-flachglas.de/shop/datenblaetter/bf-data-sheets-english/datenblaetter_engl.html if the data sheet in hand can be used or if it has been tampered with. The BF data sheets are scientifically substantiated. Their performance criteria have been developed on the basis of several profound research projects. The members of the BF Warm Edge Working Party invested a great deal of work, expertise and money into the system of the BF data sheets, to provide window producers with a rather simple but sufficiently accurate method for the determination of Uw-values. This is why the preparation of a BF data sheet is something like the 'ultimate accolade' for a spacer system. It shows the market, that the system is acceptable. There is always a good reason if the BF has rejected a data sheet application. Greatest caution should be taken if - after being rejected - the manufacturer asks a third party to establish a data sheet, which even looks similar to the official BF data sheet. 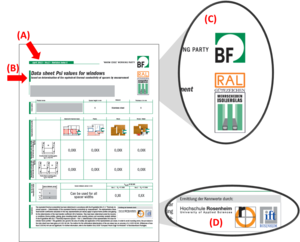 It is bad enough that some parties simply copy the chart with the Psi-values from an original ift test report, sometimes the plagiarism is even combined with stolen logo of BF/GMI and University/ift Rosenheim. If someone becomes aware of any misuse, the BF asks for notification. (A) The data sheet carries the date of publication, a serial number and a revision index. (C) The right upper corner shows the logos of BF and GMI. (D) The bottom shows the logos of both scientific partners of the Warm Edge Working Party, University Rosenheim and ift Rosenheim, to certify that the values were determined by a notified body.